The LV 39 was built by David Carll in Pelham, NY in 1875 for use as a relief lightship for general coastal service. The design was typical of the era: the hull was built of white oak and locus wood, which was fastened with copper and galvanized iron. The ship had two masts with daymarks on both, as well as a smokestack forward of mainmast. Though she was a sail-schooner rig design, the vessel had two auxiliary steam boilers, a steam pump and steam fog signal. In fact, the LV 39 was the first such lightship to be equipped with a steam fog whistle when she was built. The LV 39 was also one of 12 lightships equipped with a submarine bell at the time, having one such device installed in 1911 (Marty Krzywicki, personal communication, 2004). In a smaller, wooden vessel like the LV 39, the bell would have been in the lower portion of the ship and near the keel. A sailor would strike the bell manually (see photo below). As they became more sophisticated, submarine bells were submerged 25-30 feet below the vessel and struck with a set frequency. A ship or submarine equipped with underwater sensors could detect the signal from the lightship and time the intervals of signals from the submarine bell to calculate the distance to the lightship. The LV 39 had various station assignments over her 60 year career: 1875-1876 she was stationed in Vineyard Sound (MA); 1876-1877 Five Fathom Bank (NJ);1877-1897 Relief (MA); 1897 Relief (NY); and finally from 1897-1935 she was stationed at Brenton Reef (RI). By 1882 the vessel had required extensive repairs to replace rotten timbers and overhaul her boilers. In 1905, the lightship was struck by the battleship USS Iowa, causing severe damage to her bow section and headstays. 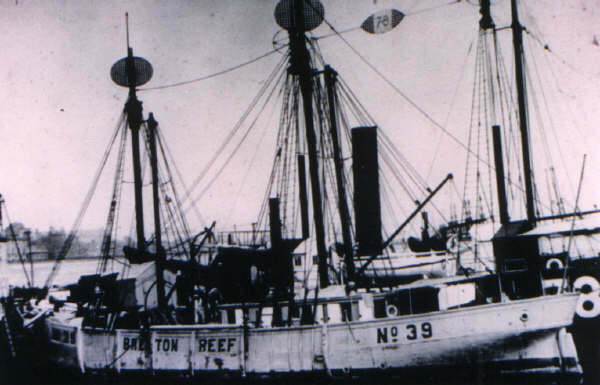 The vessel remained assigned to the Brenton Reef station until her retirement in 1935 at the age of 60. Unfortunately, according to the USCG Lightship Sailors association, as of 2004 there are no known living persons who served about the Lightship. In 1935 she was stripped at the Chelsea Lighthouse Depot and sold on June 4, 1935 to Alfred John of Cambridge, MA. In the subsequent years, the LV 39 saw use as a floating restaurant and as a U.S. Coast Guard Auxiliary Lightship Flotilla 1504 clubhouse as late as 1967. In 1974, the Boston Herald ran a caption showing a decrepit lightship sunk at the dock at Peninsula Yacht Club on Summer St. in Boston (Courtesy Capt. Eric Takakjian, 2004). She was re-floated and made seaworthy enough to attempt a tow her to Beverly. However, the lightship took on water and sank while en route. The wreck was first dived by Bob Foster, David Caldwell and Heather Knowles and on July 5, 2004. The wreckage was discovered by Foster while we were marking positions of known wrecks offered by Ray Bates. Archival photos match up closely against images and observations from the wreck. Additionally, independent measurements of the dimensions of the wreck taken several times by different divers also match closely with those of the LV-39 to the extent an accurate measurement is possible, given obstructions from nets and overall decay of the wreckage. The wreck lies upright and listing to port in 180 feet of water and affords about 20-25 feet of relief. The wreck is generally free of nets with the exception of the bow and stern areas and may be penetrated to the lower most decks.